Hidden in amongst the trees at the end of a long garden, we have designed and built two separate timber-framed buildings for use as a home office/studio and a model-making workshop. 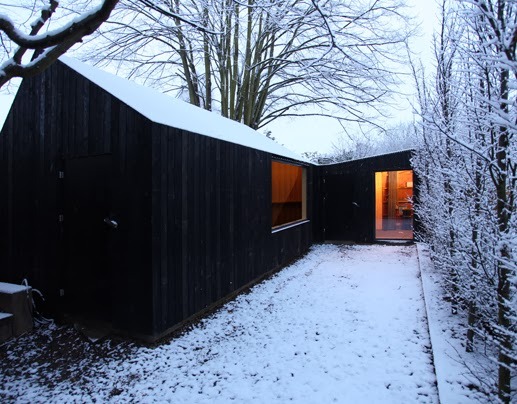 The structures are clad in vertical black-stained softwood boarding of varying widths – wider on the studio and narrower on the workshop. On the studio, the cladding forms a continuous rainscreen and wraps the entire building. The larger studio building is very highly insulated (using 150mm Cellotex combined with Super Tri-Iso) and incorporates a super efficient air-source heat pump. Calculations indicate that the annual heating bill will cost less than £21 in electricity costs. The building is wrapped with a black timber rain screen over a complete wrapper of a rubber membrane for water-proofing.